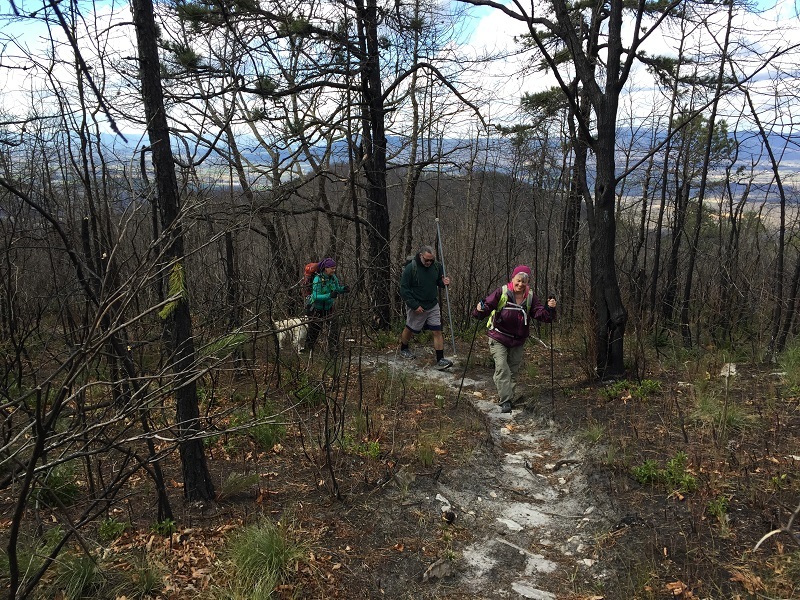 A group of 12 including hike leaders Barbara Martin and Howard Davis had a fantastic hike to Hanging Rock. This hike was a joint hike with Old Dominion ATC from Richmond. Anita & Jim Hall and Lisa Mercure made the trek from Richmond to join us. 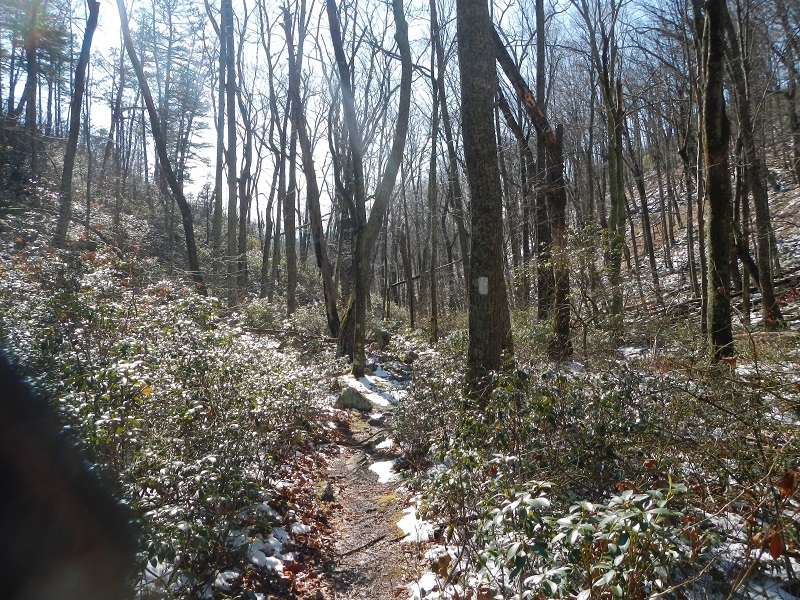 Also on the scene were Andre Meyer, Gerald Boggs, Claire Cline, C J Woodburn, David Crowe, Iva Gillet plus her hiking dogs Remy and Colt, and Bill Holman. 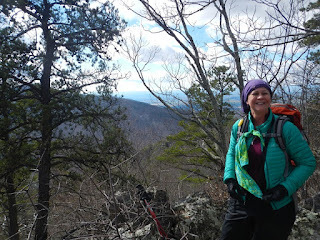 The weather was at times windy and a bit chilly, but we lucked out with beautiful sunlit skies for our lunch on Hanging Rock with spectacular views of Three Ridges and the Priest. Hiking co-leaders Jeff Monroe and Howard Davis were joined by John Brandt and two new hikers, Johanna Song and Gabriella Novoa, and Johanna's dog Bear for a hike starting at the Boy Scout's Camp Shenandoah at Swoope. 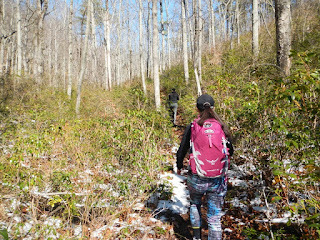 The group climbed Little North Mountain over King's Gap, and descended a beautiful but little known national forest trail to the trailhead for the Falls Hollow Trail. 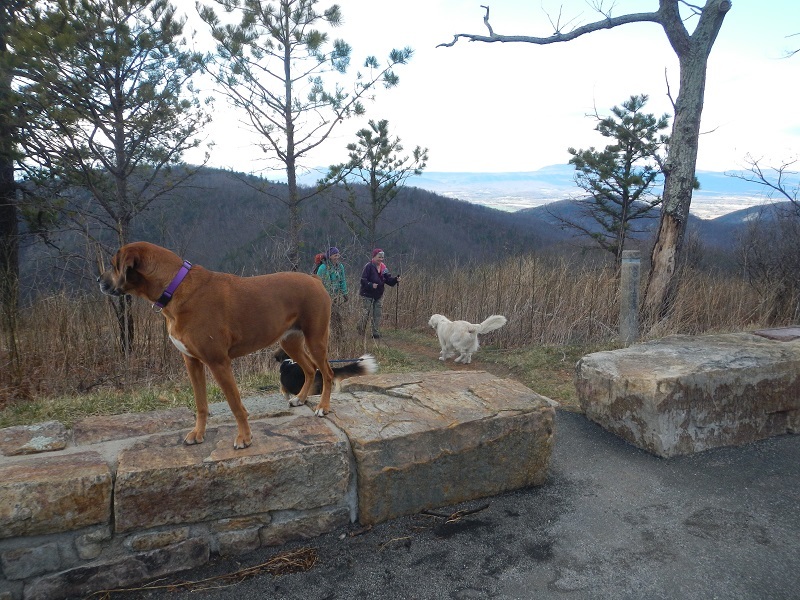 Bear was not happy with the descent from King's Gap, due to activity at the nearby Shenandale Gun Club! 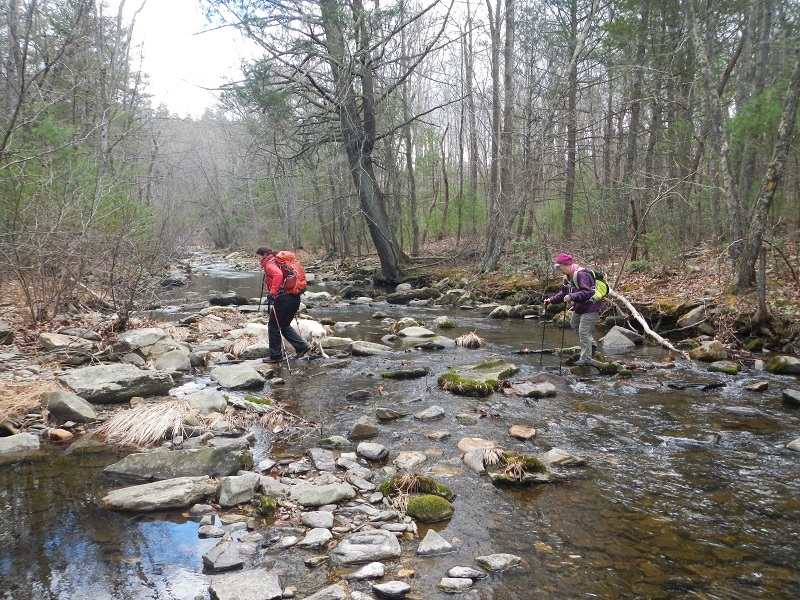 But he had calmed down by the time the group hiked past the falls west of Rt 42. 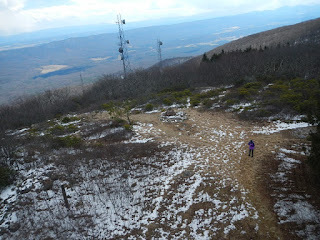 Everyone then ascended to the summit of Elliott Knob where they faced the full brunt of the day's wind and cold. 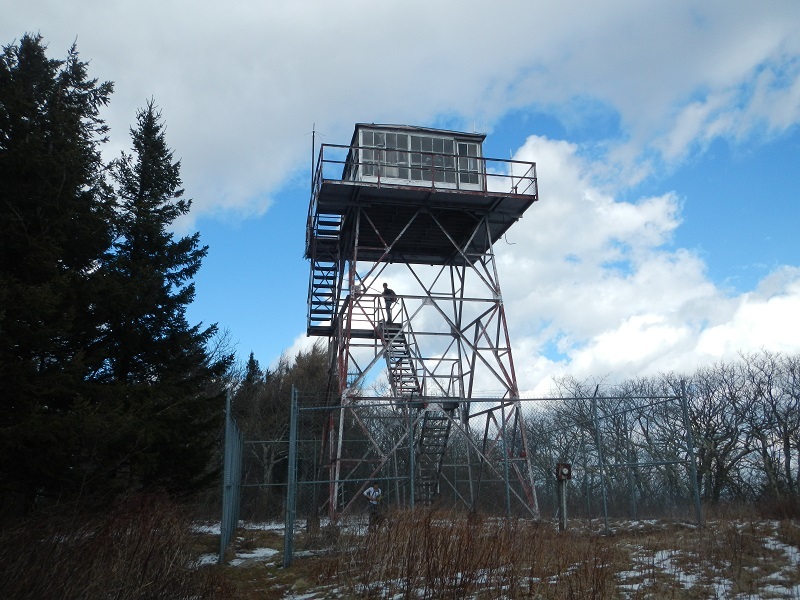 Fortunately, the fire tower was unlocked and the group could lunch there! 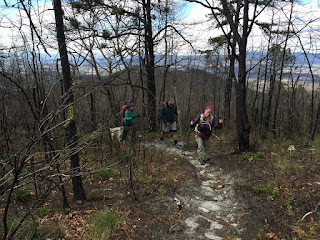 After a warm and leisurely lunch, the group descended the Elliott Knob access road to a shuttle car, dropped before the hike started. 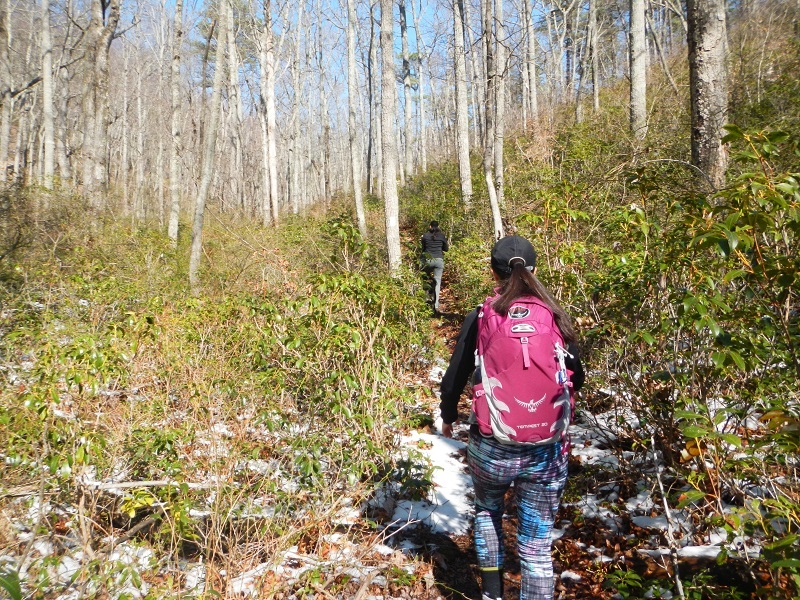 A UVA vacation day known as "Spring Break Day" was the reason 5 hikers headed out to Shenandoah National Park to hike the Big Portal/Brown Mtn Loop on Friday, March 10th. 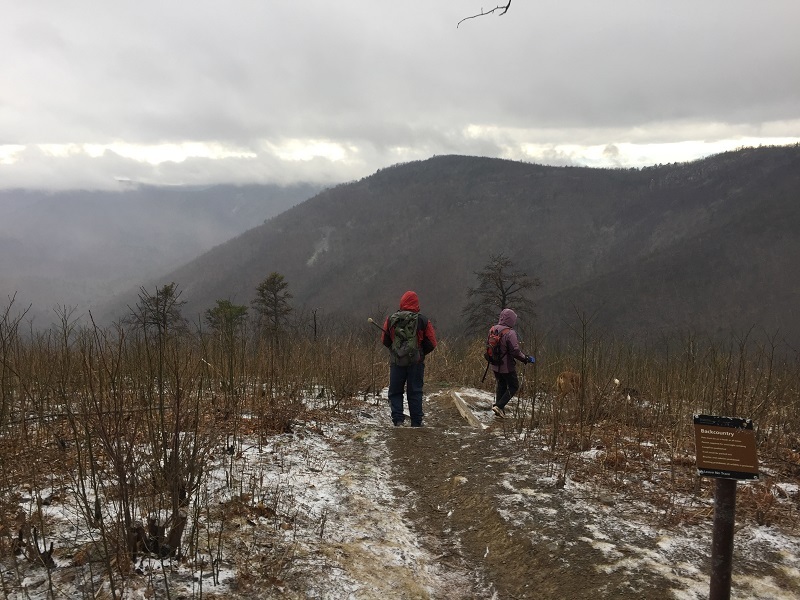 Hikers included Iva Gillet, Jeanne Siler, Lisa Lampe, John Brandt, and hike leader Jeff Monroe, along with three dogs. 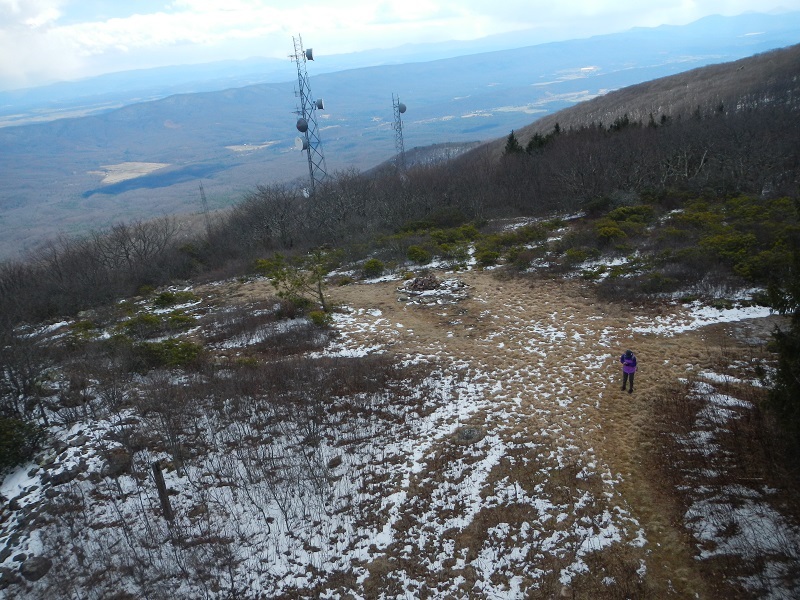 The hike started out in sleet on the Skyline Drive, but the hikers descended into better conditions only to find a stiff wind on the return climb. 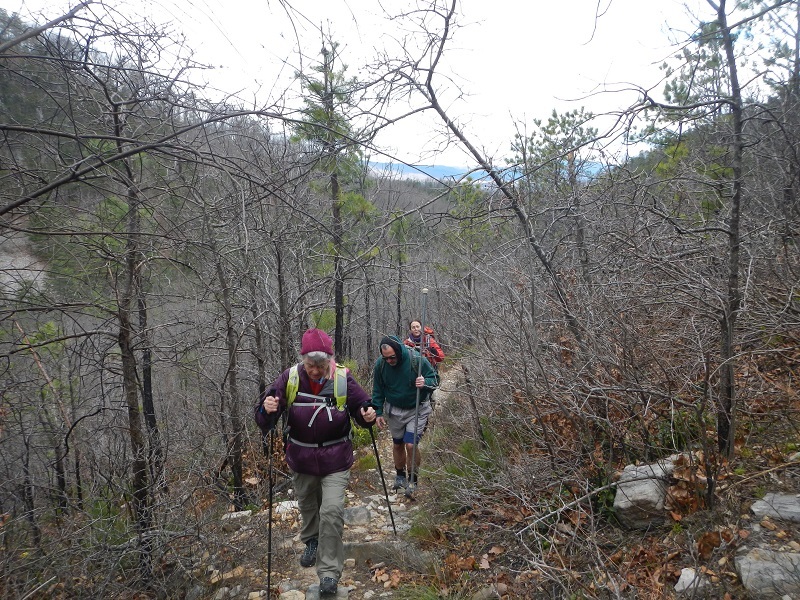 The hikers enjoyed looking at the remaining remnants of last Spring's fire, along with a good workout. 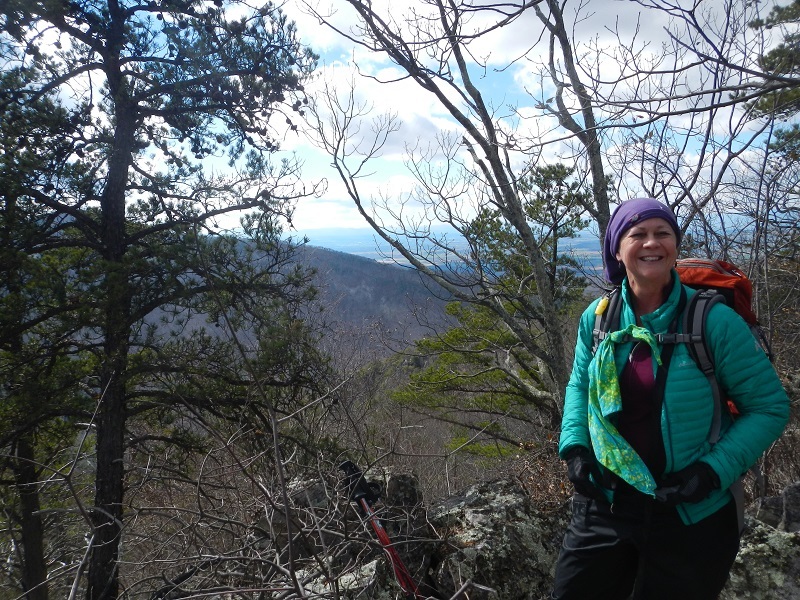 Congrats to Jeanne for completing her longest hike ever! 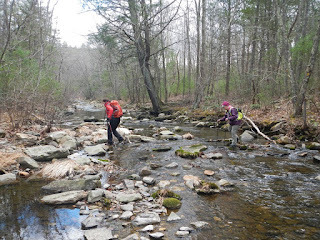 Despite warnings of rain eight hikers, Nancy Handly, Susanna Williams, John Brandt, Dave Borszich, John Sinclair, Dan and Jeanne Ralston and Andre Meyer joined hike leader, Barbara Martin on the Chimney Hollow Trail west of Churchville. The day started out cloudy, but unseasonably warm for February. 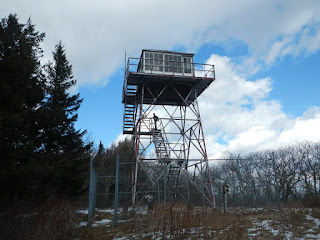 We wound our way past a stream and then started the climb to Crawford Mountain with beautiful views to the west. We were congratulating ourselves for beating the rain and seeing blue skies in the distance. 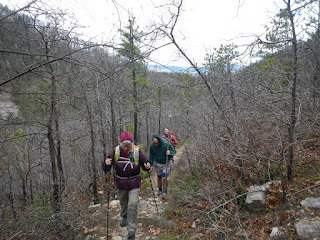 We reached the intersection of Crawford Mountain Trail and took a break for lunch. Our blue skies predictions were blown away 10 minutes into lunch with a sudden fierce wind and pelting sleet. 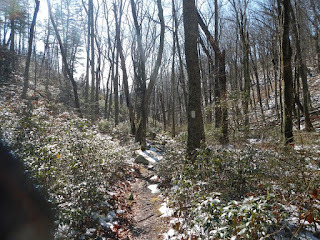 We packed up and hurried down the mountain and after a mile or so ended the hike at a relaxed pace.